After breakfast last Sunday, I took hold of Jake's sketch pad and #1 and #2 pencils and started drawing while using one of the pics in my iPhone folder as my inspiration. I think I put in about an hour of work that time and resumed the sketch just this morning until I finished. 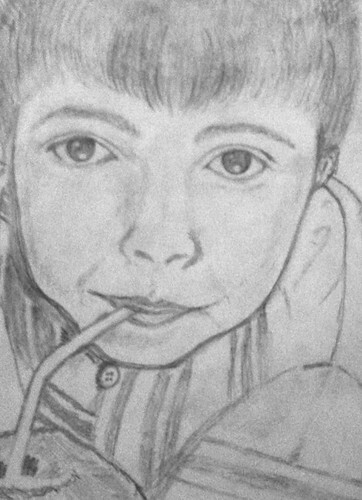 Sans any formal drawing lessons, the image I did could very well look strange or resemble somebody you or I know, but I actually want it to look like the picture of my Jake sipping fresh young coconut juice. the important aspect in a human face are the eyes and you captured Jake's. Good job. I enjoyed my painting class when we were 11-12 yrs old, would've enjoyed it more if you were with us. I think you were 13 then and had more interest in other things...but I was sure you had the gift.